What’s this? A presentable action figure of one of video game history’s most legendary and revered figures? 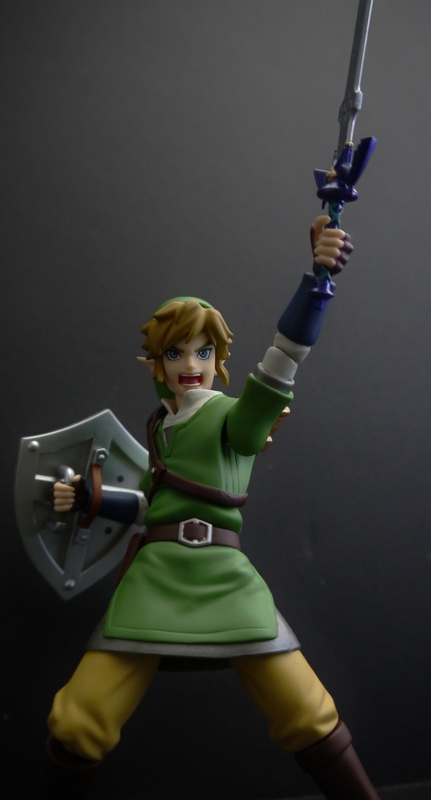 An actual articulated, detailed, and quality figure of Link, the Hero of Time/Winds/Twilight? I could hear the fanboys/fangirls squealing already (including myself) when the first pictures of this Figma hit the net. At long last, it’s here. Now, to my knowledge, there’s pretty much no other presentable figure of our favorite video game hero out there. You get the dated, more statue-esque retro ones that came out around Ocarina of Time‘s era (which were nice, but nowadays run at extremely high prices and everyone’s too scared to open ’em ’cause they’re vintage), or the stupidly expensive statues from First 4 Figures (which, mind you, are really something to drool over, but not everyone can pull $200-600 out of their butts for a desktop statue). 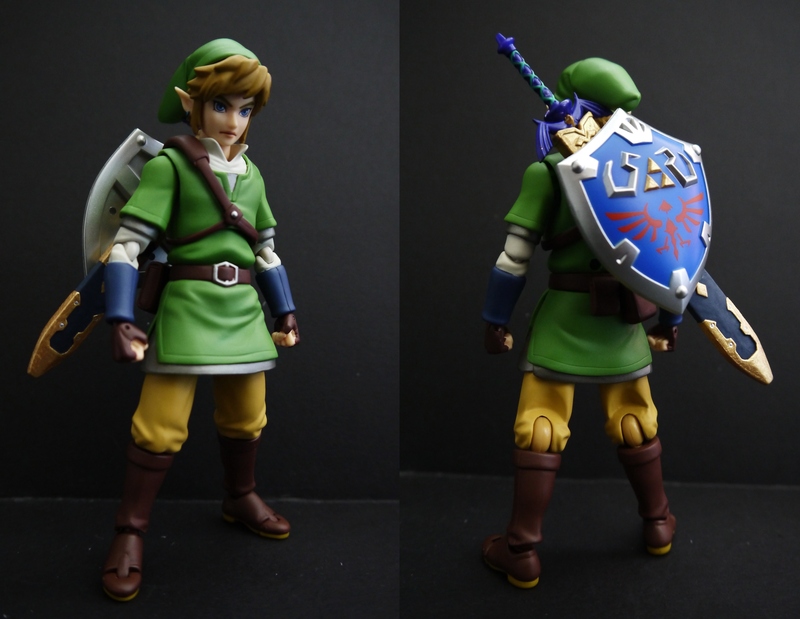 Come 2012, and we get a fully articulated, detailed and game-accurate version of Link from The Legend of Zelda: Skyward Sword. On a personal level, I absolutely loved Skyward Sword. Gameplay was great, didn’t have much trouble with the controls, and story and design were overall fantastic, with just enough originality not to be boring but bringing back that great Zelda nostalgia all the same. 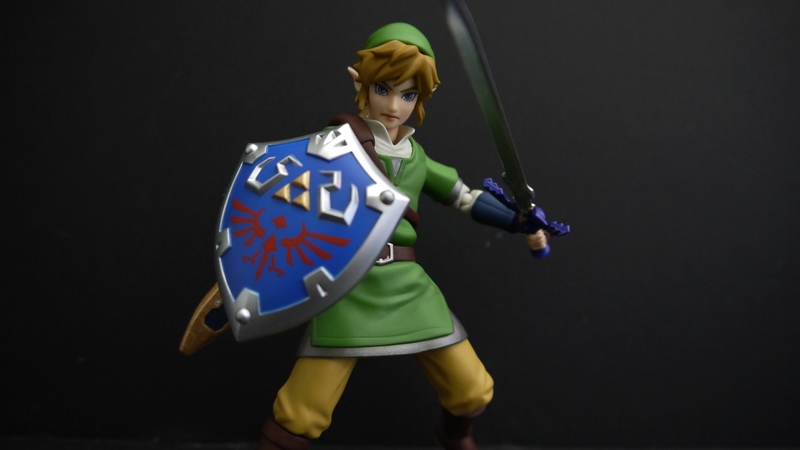 Though, this isn’t a review about the game…Link himself in Figma form looks pretty spiffy; you get all the hallmark traits that he sported from the game, and generally great material use and sculpting. Now, this is a fairly inexpensive, affordable mass-produced figurine, so of course it’s going to have the flaws that come with its caste. Not all the joints are hidden, and some are pretty obvious (knees) from the back, though it’s necessary to provide the figure with movement, and can’t really be helped. Overall I don’t think the exposed joints distract from the figure at all, and you have plenty of impressive engineering that hide points of articulation like softer PVC-esque plastic. The largest qualm I had with this figure upon taking it out of the box was the crappy paint job in general, which are most noticeable on the accessories such as the sword and shield. The paint in general looked dull, sloppy, and you got paint leaks everywhere. Not very professional quality at all. The gold on the Master Sword’s sheath was a piss-yellow, and the sword itself was molded in metallic blue with silver edges. I wouldn’t have had a big problem with the choice of metallic blue for the sword center, but what bugged me is that the silver edges were horribly painted; they didn’t even stay straight as they went up the blade. Something had to be done. Therefore, I went ahead and cracked open my gold and silver paints, and went ahead and completely repainted the entire sheath in a somewhat more presentable gold, and made the entire blade of the Master Sword silver as it should’ve been. The gold Triforce on the Hylian Shield was also painted over to match the rest of the accessories. Another slight peeve is that the underarmor/chainmail that Link has below his tunic is just a plain silver sheet and rather undetailed. It’s not a big issue, though some texture would have been welcome. You get one neat little effect part to show Link swingin’ his sword all ’round and bushwhackin’ for Rupees. In actuality, I’m pretty sure this is to simulate the Skyward Strike, but whatever. It’s a really nice clear blue piece that just slides right over the Master Sword. While it does look a little cliche, I really have to hand it to Max Factory for capturing motion in a piece of plastic so well. 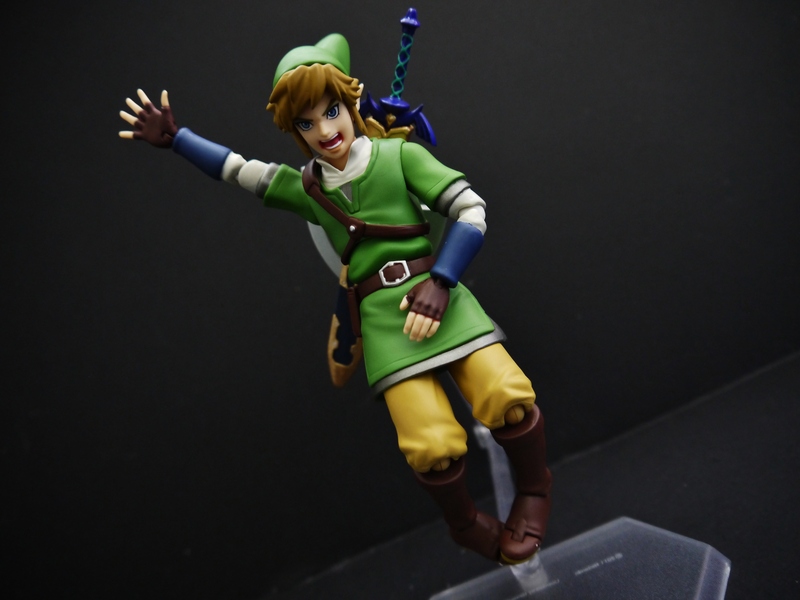 Link’s articulation is pretty standard, though I wouldn’t say it’s anything impressive by far. The knees and elbows bend, the legs and arms move, the head turns, the toes bend, and you get a swiveling torso. I’m impressed once again by Max Factory’s implementation of the turning chest to compensate for a lack of waist. The joint is hidden pretty much dead-center inside Link’s torso, and the way they molded the tunic, it’s completely flawless movement. You can’t even tell, it looks so smooth. Neatly enough, the hat can also swivel and move on its own little joint. Max Factory really went that far. 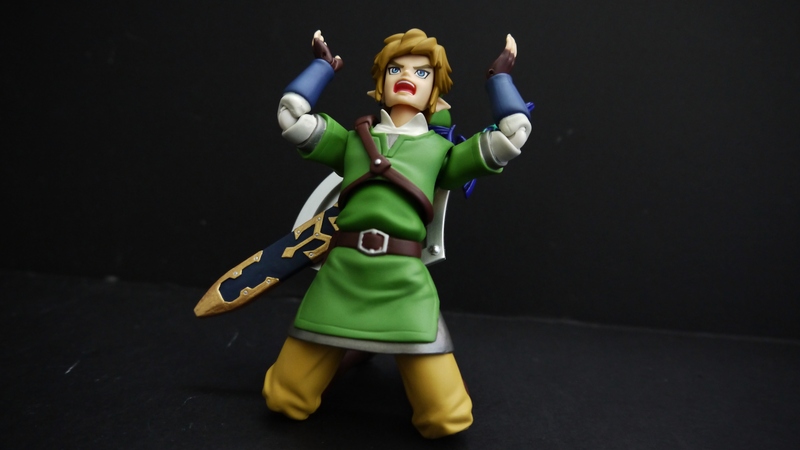 On the flip side though, Link’s arm articulation seems rather lacking. The biggest qualm is with his shoulder movement; they can turn a full 360, but don’t point straight up. Instead, due to the limitations of the body, when you have the arm extended upwards for the Skyward Strike, the sword-wielding hand is pointing pretty far out, instead of straight up. Though this really isn’t a huge deal since you can still make it look decent with the right camera angle, in person it could look kinda funky. Not gonna lie, I think my favorite part of this figure is the rage face. There’s nothing wrong with the sculpt; I personally think it looks fantastic, but you can just get so many silly poses out of Link with it. Definitely adds a lot to the figure’s play value. 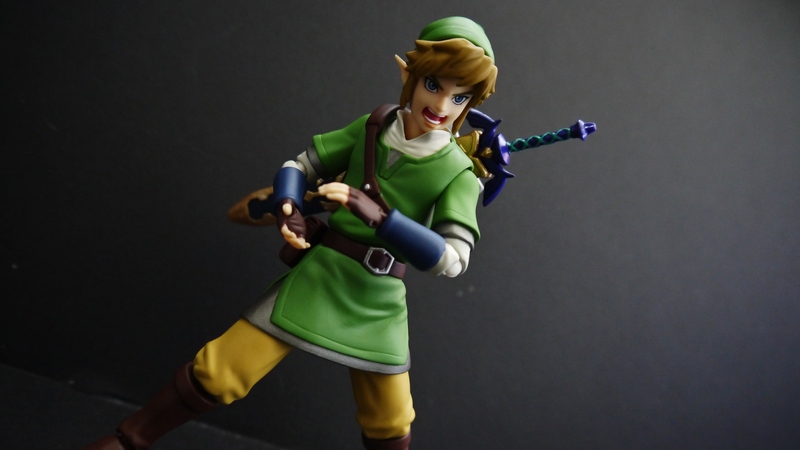 Link gets the regular placid face and hair, and an optional swappable set of blowing-in-the-wind hair and the awesome screamo face. Now, about the hands…Max Factory goes ahead and includes a rather impressive arsenal for you to play around with, including regular slotted hands, the pointed slotted hands for swingin’ the sword, giant open palms, closed fists, and relaxed palms. The biggest problem with the spare manipulators relates directly to Link’s main weapon, his sword. 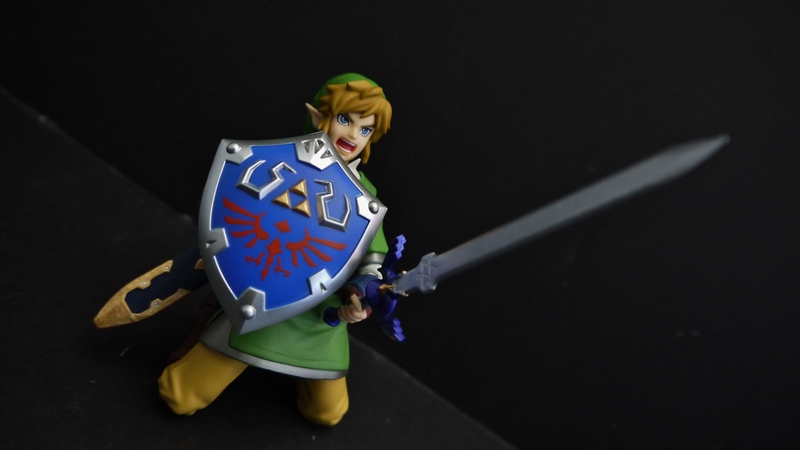 For some reason Max Factory thought it reasonable not to make the pommel of the Master Sword detachable or anything for easy insert of a holding hand, but instead make consumers take on the scary task of forcing the fingers around the handle themselves. Given that the thumb and index fingers are only about 1mm apart from each other, it’s an absolute nightmare getting Link to hold his weapon. It’s never mentioned that one must compromise the integrity of the Master Sword to make it wield-able in the small instruction manual included, and for the longest time I thought you were simply supposed to remove the pommel of the sword, which would be the logical thing to do. This is honestly my biggest gripe with the figure, seeing as I’m far too scared to change its pose anymore if it involves swapping out the sword hand. At the end of the day I really do have to admit this is a fun little figure to play around with. 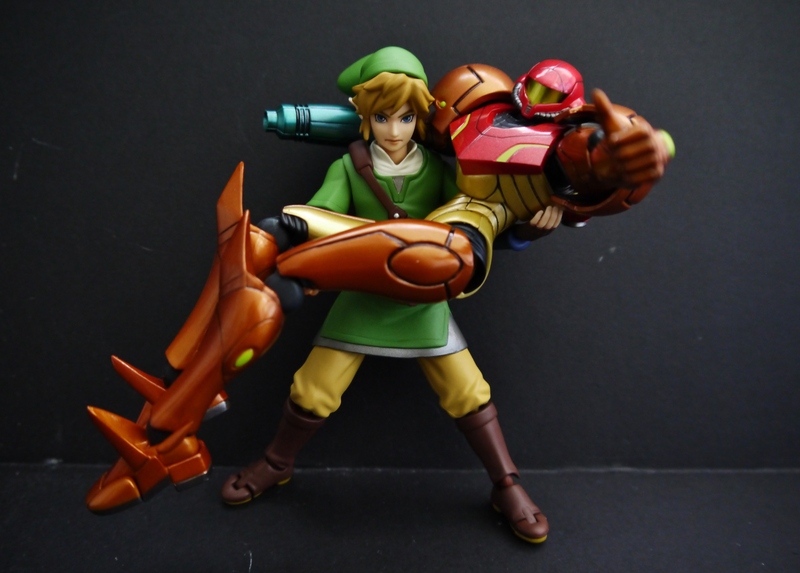 Given that it’s Link, there’s so much you can do with him. My only real gripes are with it’s horrible paint apps and derping sword-holding functions. The former can be fixed if you know how, though the latter makes me want to throw the figure against the wall sometimes. Sculpting and design are great, though a lot of that is attributed to personal preference. I’m not gonna knock it for it’s articulation since it’s pretty good as it is, and the slight limitations it has can’t really be avoided. I’d say Link is a worthwhile buy, a neat little piece considering the lack of real figure merch for our favorite green-clad hero out there. More Nintendo, please and thank you Max Factory.